Snap off bases of asparagus. In a large covered saucepan, cook asparagus spears in a small amount of water 3-5 minutes until crisp-tender. Drain and plunge into ice water, drain again and pat dry. In a medium bowl combine cream cheese, lemon peel, lemon juice, cayenne pepper. Fold in flaked salmon and basil. Spread on tortillas. 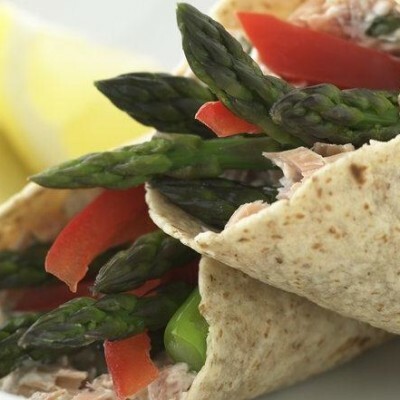 Arrange asparagus and sweet pepper strips atop salmon mixture. Roll up tortillas.